(MIDDLETOWN, CT) September 6, 2018 – The Wesleyan Media Project is releasing its second post in a series of regularly updated overviews of issue mentions in federal races by state. 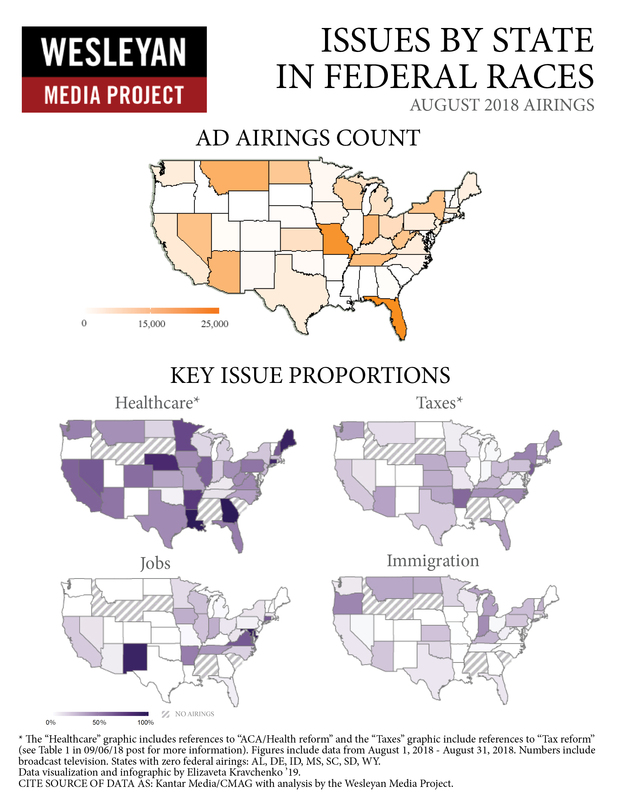 Below we show the number of ads that aired in House and Senate races in each state from August 1, 2018, to August 31, 2018. We break down the percentage of ads mentioning six key issues tracked by the WMP. For example, over 16,000 ads aired in federal races in Arizona last month. A majority (53 percent) of those ads mentioned the issue of healthcare, and just over one in every five (21 percent) of them mentioned immigration. Note: this is not a comprehensive list of issues tracked or issues mentioned, and other topics may be discussed more frequently than those in the table. Compared to our prior release aggregating airings from January 1, 2017 through July 31, 2018, references to healthcare have gone up (from 32 percent overall to 37 percent) as a proportion of all airings in August as have references to immigration (from 13 percent overall to 15 percent) while discussion of jobs and taxes have decreased slightly (from 18 percent to 12 percent on jobs and 24 percent to 21 percent on taxes). The “healthcare” column includes the references to “ACA/health reform” efforts in addition to more general reference to healthcare. The “taxes” column includes the references to “tax reform” in addition to more general references to taxation. Percentages across the four main issue columns (healthcare, jobs, taxes, and immigration) may total more than 100 percent because ads often feature more than one issue. The WMP plans to release updates to this analysis throughout the fall campaign season. * The "healthcare" column includes references to "ACA/health reform" and the "taxes" column includes references to "tax reform." ** Includes explicit references to the Affordable Care Act/Obamacare and/or references to how health care should be or has been reformed (including references to Republican legislative efforts). † Total includes several hundred ads promoting candidates from other parties. Figures are from August 1, 2018 - August 31, 2018. Numbers include broadcast television. States with zero federal airings during this period: AL, DE, ID, MS, SC, SD, WY. CITE SOURCE OF DATA AS: Kantar Media/CMAG with analysis by the Wesleyan Media Project. Data reported here from Kantar/CMAG do not cover local cable buys, only broadcast television, national network and national cable buys. All cost estimates are precisely that: estimates. The Wesleyan Media Project (WMP) provides real-time tracking and analysis of political advertising in an effort to increase transparency in elections. Housed in Wesleyan’s Quantitative Analysis Center – part of the Allbritton Center for the Study of Public Life – the Wesleyan Media Project is the successor to the Wisconsin Advertising Project, which disbanded in 2009. It is directed by Erika Franklin Fowler, associate professor of government at Wesleyan University, Michael M. Franz, professor of government at Bowdoin College and Travis N. Ridout, professor of political science at Washington State University. WMP staff include Laura Baum (Project Manager), Dolly Haddad (Project Coordinator) and Matthew Motta (Research Associate). The Wesleyan Media Project is supported by Wesleyan University. Data are provided by Kantar Media/CMAG with analysis by the Wesleyan Media Project. WMP is partnering again this year with the Center for Responsive Politics, to provide added information on outside group disclosure. Periodic releases of data will be posted on the project’s website and dispersed via Twitter @wesmediaproject. To be added to our email update list, click here. Wesleyan University, in Middletown, Conn., is known for the excellence of its academic and co-curricular programs. With more than 2,900 undergraduates and 200 graduate students, Wesleyan is dedicated to providing a liberal arts education characterized by boldness, rigor and practical idealism. For more, visit wesleyan.edu.